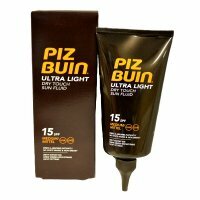 It Combines Immediate & Effective UVA/UVB Protection With An Ultra Light formula That Dries Instantly. The Hydrating Fluid Spreads Easily Over Your Skin For A weightless Dry Touch Feel. The Non Sticky & Non Greasy Formula. Absorbs Instantly Without Leaving White Mark. Skin Feels Silky & Smooth. It Helps To Prevent Sun Induced Premature Skin Ageing.